The word “genre” has a lot of weight to it. Arguments about whether a particular work is, or is not, part of a given genre are long, and tedious. Season Eleven will not be engaging in those arguments. We’re giving all that a wide miss by adding an adjective, and defining a new term: Elemental Genre. During 2016 we are going to explore what we write, why we write, and how we write in much the same way as previous seasons have, but our guidepost this year will be this concept of Elemental Genres. In January we’ll stay high-level and firm up the framework. 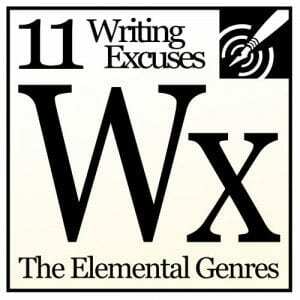 Starting in February we’ll drill down on each of the Elemental Genres, and explore the writing process. We’re really excited about this year’s format, and we’re confident that by examining our writing in this way we’ll learn (and perhaps even teach!) some new things. Note: 2016 is a leap year, but this episode was recorded in 2015. When we said “it’s not a leap year” we were confused.